With a Magnuson supercharger, your Jeep Wrangler 3.6L will deliver extreme torque while maintaining its everyday drivability. Magnuson supercharger systems deliver torque across the entire rpm band. Whether on the streets or blazing a new trail in the great outdoors, you will never have to wait for power. When you're not on boost, Magnuson's bypass valve systems opens to virtually eliminate drag from the supercharger, giving you factory-like fuel economy when you're cruising and commuting. Meanwhile, all that torque and horsepower is at your command, and available instantly when you most need it. 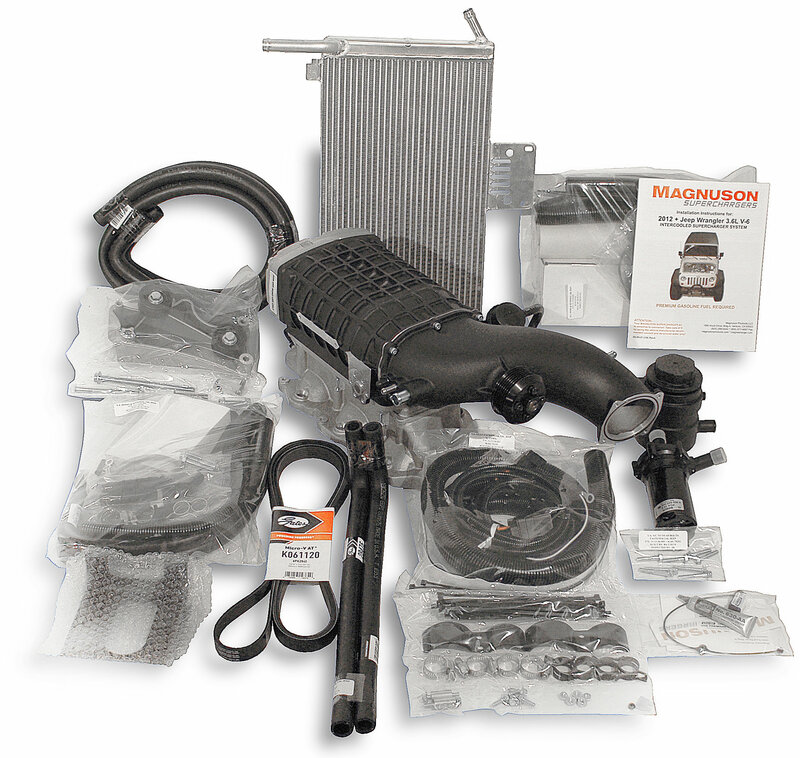 This system contains Magnuson's cast aluminum intake manifold, MP 1320 TVS supercharger as well as all of the fittings, lines, belts and hardware needed. Includes an air-water intercooler system with a high-efficiency Charge Air Cooler (CAC), coolant circulation pump, coolant reservoir, and vehicle-specific Low Temperature Radiator (LTR). Additionally, this supercharger system comes with all of the necessary tuning and fuel system upgrades your Jeep will require to handle the boost this blower delivers. This includes new high-flow fuel injectors that retain all of the factory "push-lock" connectors and a handheld programmer. Magnuson's ECM recalibration ensures proper adjustment of the air/fuel and ignition timing settings to optimize and manage the increased torque and horsepower of your supercharged Jeep while maintaining its street driving manners and fuel economy. As you can see this is a truely complete system with all of the components required for a professional, and OE-looking installation. You will not need to purchase any additional components to transform your Jeep into a stump-pulling HEMI-swap killer. After much research, when these kits were first becoming available I chose the Magnuson supercharger kit to upgrade my '12 JK Call Of Duty edition Rubicon 4 door. I did most of the work myself with limited advance knowledge of this kind of project, although I rebuilt the top end of my Triumph (790cc - 904cc jugs, cam, ported heads) just watching a you tube video. I'm a dentist by trade, but a handy man in spirit. I really only needed help carrying the supercharger unit and installing it on the manifold...I remember the far driver's side corner took a bit of coersion to tuck it under the firewall lip as you need to ensure you don't damage or score the unit in anyway during installation thus preventing any extraneous leaks. Took me a good day and a half, with an extra set of hands for 2-3 hours...and some canned adult beverages. 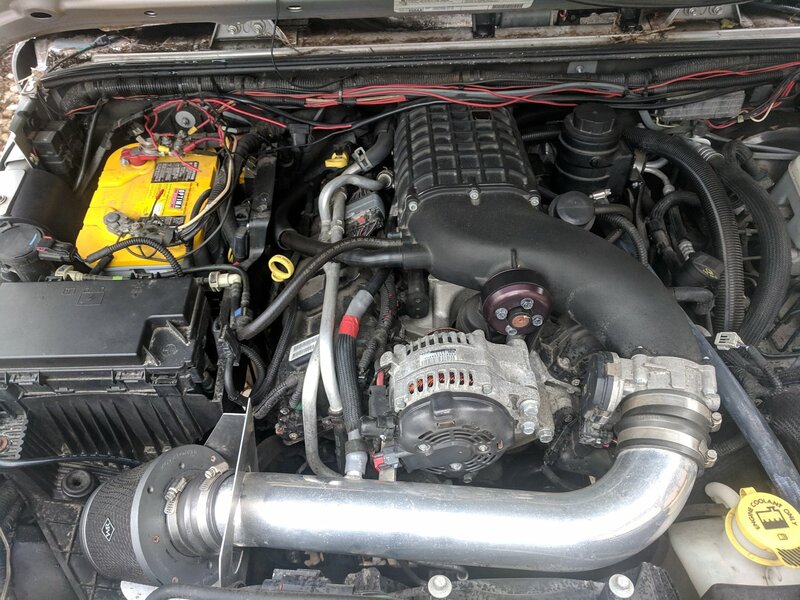 I was impressed by the gains, especially after changing out the restrictive stock airbox/filter complex and replacing it with a cold air intake. The intake change makes a huge difference in a forced induction system, moreso then without the supercharger. The tune updates they provide for the stock tune is good, and they improve the tune every 8-12 months as the product data is further reviewed. Their customer service is awesome, as I have had some lengthy back and forth with questions. Always answer within a day, mostly within hours. With the 3.6 being less of the dog that the 3.8 was, but still not what should be offered in this fine machines (v-8 please), a supercharger is almost a must. I'm happy with my Magnuson. It looks better then the Ripp I'm hoping, and the twin opposing vortcies induction fans makes for a more efficient, lower prophile upgrade. And hey, chicks dig it when your Jeep is cooler than the other dudes. My $0.02 anyway. Things may have improved with others entering the game, but I would buy this kit again. If your in PA... Gimme a call and I'll help. I work cheap (see adult beverage inference above)! Does this Super Charger have a CARB EO number? Yes, it is CARB EO# D-488-37. Thank you for your question.